Why would you use WindowBlinds – An MSStyle to WindowBlinds porter manifest. If you’re an msstyles author you may want to read it. Very important: Recoloring/converting or altering icons or skins does not change the original author’s copyright, nor does it make such skin yours! If you recolor/convert or alter a skin or icon that has not been made by yourself you may not upload or share the modified skin or icon without the original author’s permission. WindowBlinds skins non-theme aware programs so all of Windows would have the style, not just theme aware ones. Users can mix and match toolbar and progress animations with it (yes there are other ways to do this but nothing as easy as WindowBlinds). You can change its color easily on the fly. For most people, it’ll run significantly (i.e. noticeably) faster. Hardware acceleration! You can assign other mouse button operations to the title bar. You can easily add buttons that enhance the theme’s functionality. You can apply advanced recoloring to it with SkinStudio. With minimum effort you can enable dropdown menus skinning after conversion. Setting SkinStudio use “maximum quality” option during conversion will make your menu bar skinned as it was a toolbar. Ability to integrate the skin with the font (the font is installed automatically as the skin is used). It comes with the skin in one WBA (WindowBlinds zipped skin) so there is no risk the theme will look weird if user forgets to install the font or just skip reading the readme where you advise him/her to. Ability to associate the skin with the toolbar icons so that they are automatically applied once you start using the skin. Same with Animations if the msstyles contains them as well. No need for them to use Additional programs as Y’Z toolbar or replace system files. User can set the Visual Style to be used for a single app while having another one fot the whole system. Users do not have to hack the dlls vital to their system systems functioning. This may not be important for you, but believe me it has raised concern more than once among our customers. That was why actually we decided to make the MSStyles converter. Our customers liked some of the msstyles but didn’t want to hack their system files. On my ssytem (though you may have either confirm or an feel differently) WindowBlinds is more stable than Msstyles. Actually changing msstyles (And I’m changing both of them a lot) kills an application running on my system at least once a 4 changes of a theme. Will it be Firefox(a lot), my Bluetooth stack (more seldom) or my programing IDE(really, really popular at dying). 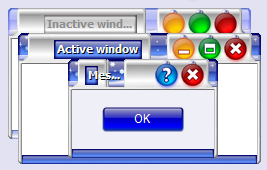 It practically does not happen to WindowBlinds any longer. And being an msstyles author you most probably know very well what I’m talking about. There is no way you could make an Msstyle that a company like Nintendo, nVidia (or here), Marvel, ATI or Microsoft (or here) would pay you for. Those are just the few themes off a top of my head, but WindowBlinds skinners are making paid themes on a daily basis. The reason why you cannot sell your MSstyle to them is that there is no way for the user to apply the theme in a legitimate way. No – a hack is not legitimate even if some companies sell them). I’m sure you’re in it for fun and not for money. That’s cool, but making a few bucks now and then doing what you love is really nice, isn’t it? That’s just 15 reasons that I think of first when someone asks me “Why WindowBlinds“. If you’re still undecided just download SkinStudio and you should be able to just double click on your .msstyles file (make sure you unzip it to a directory first) and have it imported in. SkinStudio is a free download that will not expire on you and will allow you to convert msstyles to WindowBlinds and edit your themes indefinitely! Be aware that even though it’s still not perfect (especially the Free version is rather old) there will be a new SkinStudio release right after the New Year (Jan 2005) that will significantly improve upon what it does now. Object Desktop subscribers may already enjoy some of the improvements. More to come! I used elements of Brad’s post from Neowin in my article – thanks for the inspiration Brad. How to successfully recolor skins with SkinStudio. I am aware that this article is partially redundant. I’ve written similar article in about a year ago but it was concerning icons. IconDeveloper is fairly similar in this term to SkinStudio since they share a great deal of their code base. However there I suppose there may be a significant number of people not realizing that – hence the article. It’s not as hard as David Copperfield would like you to think it is. How exactly do you create those criters? At first it may seem a tedious job but once you have all the frames, you’re pretty much set. There was a concern by some users why SkinStudio shares a start menu with the original substyle when you create another substy;le based on it..
Basically the answer is – It’s not a bug – It’s a feature. It’s like that by design. If you select a prefix on save then you will get another start menu as well, otherwise skinstudio will use the same stuff for 2 reasons. it does not know how to name the new “xpstuff.xp”. it does not know whether you really want to break the connection. You may as well want to just make a variation of your skin with slightly different titlebar buttons. But imagine it did that so 2 things happen – you didn’t specify the prefix to create new images so once you change the images in one substyle you change them in the other too since you didn’t tell it to make copies of them. Now imagine how outrageous it would be. “But it uses another xpstuff.xp” you would say. “Why one substyle breaks the other substyle images” you would say. And you would be right. if everything’s duplicated then everything is duplicated, if nothing then nothing. When you want the substyle to have a different start menu, after you create the new substyle you need to click “taskbar” in the navigation tree in the left hand side of the window, then over on the right click on the word file, and then below, in the “value” text entry field you can change the name from the default (XPStuff.xp). Keep your great skins coming! Are there no limits to customization? Very important: Recoloring or skinning icons does not change the original author’s copyright, nor does it make such icons yours. If you recolor or skin an icon that has not been made by yourself you may not upload or share a recolored icon without the original author’s permission. In the next few days Stardock is publishing the next component of it’s extremely successful ObjectDesktop. The new component is called IconDeveloper – the tool’s , I’m the developer of, main purpose is to make it easy for casual users to create icons and make it faster and more efficient for professional icon artists to do their work. Celebrating the event I decided to write a short article about going really crazy with icons and how to do it with IconDeveloper. What skinning means (but is not limited to) is changing the look of certain part of applications. The article will describe how you can change the appearance of an IconPackager theme or an Icl file (Icon library). So you recolored your icons already? (If not checkout the article about mix matching your themes with your skins – the functionality described there is now a part of IconDeveloper). But it still isn’t enough? Why stop on recoloring? Why not make your icons exactly how you want them to be? Why not SKIN THE ICONS? I have recolored according to my taste (or lack of it) the great Bant’s “Ciela” Visual Style (Please do not ask for the recolored skin. Curtesy of Bant, it’s available here for free and you can easilly recolor it with SkinStudio). It has a kind of toxic look now, which if you have seen the screenshots in some of my previous articles, you have probably noticed I’ve developed a taste for. Since i can never get enough of the marvelous PixOs icons by Paul Boyer I have decided to recolor them to match the skin. Now what can we do here… I know! Let’s set it on fire! and actually make it ultimately match my skin of choice… and a bit smoked (Why? Why not?!). To do this I’ve had to edit an image from the Visual Style to create a bevel I can now use as a background (made for sake of this artticle only). You can actually use any image for either a background or overlay – just press the “Browse” button and select the image you want to use. The possibilities are countless. IconDeveloper comes with a number of backgrounds and overlies for you to toy with, but the real potential is in your creativity. Make your own icon’s skins. The sky is the limit! Konfabulator for Windows – Everything old is new again! Could we have some decency here? Unless you lived in a glass castle for the last 6 years or never been a part of the desktop customization community you know that there already is a pretty stiff competition in that area on Windows. He sounds as if some Macintosh saviours bring the desktop customization into the abandoned wasteland of Windows. Hellooo! I have a news for you! DesktopX is at least a few years older than Konfabulator and it has always been a Windows application. And it just began from that. There are multiple desktop customizing apps epart from that, Kapsule and AveDesk to mention just a few of them. Unfortunately this is not news for Mr Arlo Rose he is pretty aware of it as I’ve been reading his rhetoric after Apple anounced Dashboard in Tiger and that just makes me all much more astonished about this statement. A few days back I found that nice Visual Style. Really easy on eyes – perfect for coding – titlebar not to high – not too many distractions. So i ran it through Skinstudio, added a few mods to make it the nice place to look and shown it to Pas (Snidely Whiplash). He’s made a couple of mods himself and I wanted to have them in my skin. But my skin was USF (yes you can apply USF skins to WindowBlinds with Skinstudio) and his was WindowBlinds. But the image format is the same, so i could just copy it and change the settings in my skin. But how would i do that without wasting an hour chasing all the attributes that needs to be changed? So i came up with 2 easy features to do that. – added possibility to copy and paste images between skins! Just select image attribute in the section view and right click it and press copy. Now right click the image attribute in the other skin and select Paste. Skinstudio will actually copy the image from one skin to another! It builds on top of another feature i’ve added recently – as for now you may just copy bitmap from your favorite image program – take Photoshop for example and just paste it into Skinstudio in the form of bitmap. based on the attribute or control you have currently selected (image attribute must be currently selected) skinstudio will do all the boring work for you. Ctrl+C , Ctrl+V it’s as easy as that. Skinstudio asks you an easy question then and takes care of all the layout changes you may ever need. You are currently browsing the archives for the Desktop Customization category.